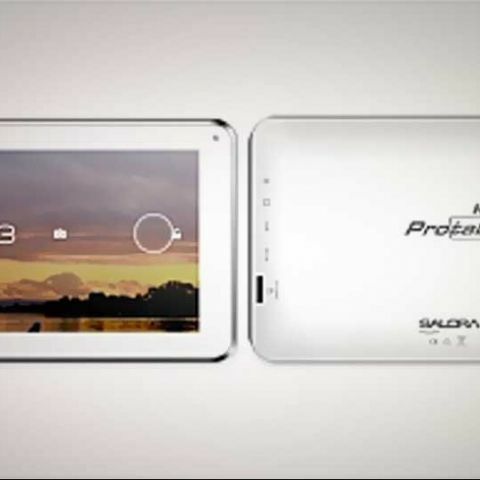 Salora has added two tablets to its product portfolio, the Protab and the Protab HD. The Protab HD runs on Android 4.1 Jelly Bean where as the Protab runs on Android 4.0 ICS. Salore has launched two tablets in India, the Protab and the Protab HD. The Protab is priced at Rs. 4,999 and has a 7-inch display with a 480x800 pixels resolution. Under the hood, a 1GHz processor along with 512MB of RAM powers the device. It has 4GB built-in storage expandable up to 32GB via a microSD card slot. It has a 0.3MP front facing camera for video calling. The tablet is 9.9mm thin and weighs a mere 290 grams. It also houses a 3200mAh battery. The Protab HD on the other hand has a 7-inch LCD display with a resolution of 1024x600 pixels. An ARM Cortex A9 1.2GHz processor, Vivante GC800 GPU along with 1GB of RAM power the device. The Protab HD also has 4GB built-in storage expandable up to 32GB via a microSD card. It runs on Android 4.1 Jelly Bean and it is 9.9mm thin, weighing in at 290 grams. The tablet also has a 0.3MP front facing camera for video calling. Both the Salora tablets come preloaded with apps, which include Facebook, King Soft, Ibibo Games, Ibibo and more. Speaking on the launch Gopal Kumar Jiwarajka, Chairman & Managing Director, Salora International Ltd, said, "After a successful launch of the smart phone which got an exceptional review and response, we at Salora are excited to launch its power packed Tablet PC series called Salora Protab. Combining features such as an ultra-fast processor, long standing battery backup, high quality camera, pre embedded applications, impressively low weight and stylish appeal, Salora Protab will enthrall and cater the needs of tech savvy consumers today. With impressive specs the Protab is not only set to compete with leading brands in its category but will also provide consumers a stunner in a budget that won't lead to another EMI." Both the tablets are available on the online shopping portal, Flipkart. It has been raining tablets these past few weeks. We have seen the launch of a number of tablets in the sub 7k-price point including the likes of the Zync Dual 7.0, Swipe Halo Value, Penta T-Pad WS708C and more.